The Grand Woods Lounge is facing allegations of unfair pay. GRAND RAPIDS, Mich. — A federal lawsuit has been filed against a popular Grand Rapids restaurant. 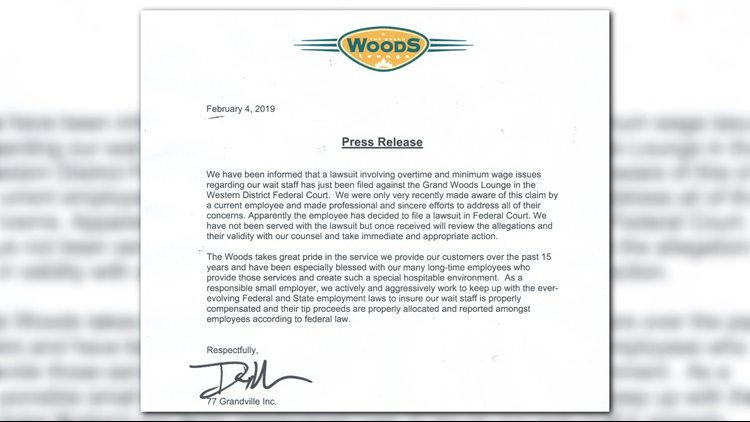 The Grand Woods Lounge is being sued by a waitress who claims she wasn't paid for working overtime. Attorneys Brad Glazier and Bob Howard filed the lawsuit Monday in federal court. "When employees are having their wages stolen, which is essentially what's happening here, it can cause a tremendous financial hardship," said Glazier. The lawsuit claims the employee was responsible for cleaning the restaurant even after she was clocked out. "It looks like she probably has about 2,000 hours where she was either not paid or underpaid, so it's not an insignificant sum," said Glazier. And it also claims the waitstaff were required to share tips with managers and kitchen staff. "Folks that aren't involved in actual customer service are not supposed to participate in that tip pool," said Glazier. And the issue may involve others. Glazier says up to 100 current and former employees could join the lawsuit which may seek more than $100,000 in damages. The Grand Woods Lounge released this statement on the issue Monday night.